As a specialized corn combine harvester manufacturer in China, we at YTO have supplied numerous harvesters to customers around the world. 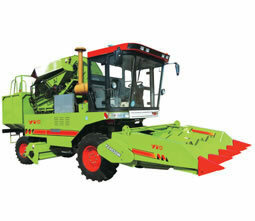 Our combine harvester is available in several models to suit different requirements. As its cab protrudes forward, our corn combine provides high visibility. Additionally, the productivity of our product can achieve 0.93hm2/h, ensuring that you complete your work quickly. With over 50 years of experience, we at YTO can offer a great variety of products, such as wheeled tractor, tractor implement, pickup truck, and more. Thanks to the constant work of our dedicated staff, we have received the ISO9000 and ISO14000 certificates, and our products have been awarded the CE, EPA and E-mark certificates. Hence, you can feel secure in purchasing our products. For any inquires, please feel free to contact us. Our staff looks forward to serving you.